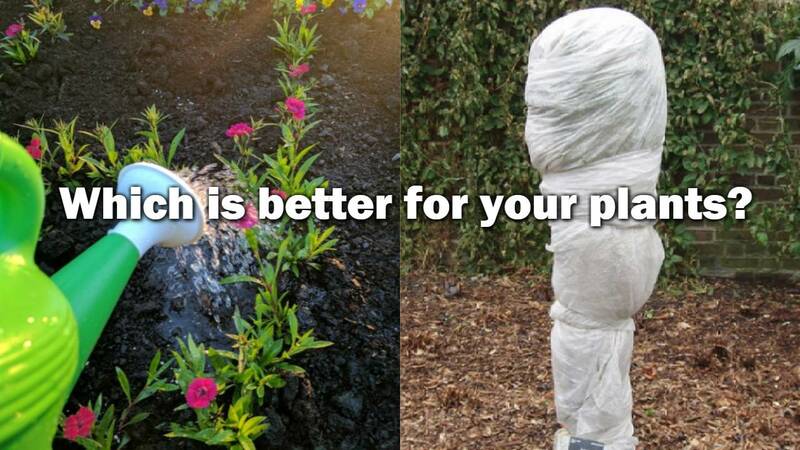 Will your plants survive better with water or blankets? Watering can be more effective in protecting plants from cold but can also cause more harm if done incorrectly. JACKSONVILLE, Fla - The calendar is not stopping frost from showing up around the First Coast tonight. The flowers are blooming and spring will soon arrive on March 20th but there are ways to save your plants from the late season cold. Plants can survive frost when they are covered or irrigated but choosing water may be an option best suited for professional growers. Cover your plants with blankets but make sure they come off so the grown can absorb more heat before the next freeze. Irrigation protection is complicated but when used properly, water can provide partial or complete cold protection when it freezes to solid ice on a plant. Heat generated during the freezing process keeps the plant at or near 32°F. Improper use of water can increase cooling or ice loading resulting in greater damage than if no water were used at all. It is important to know the ice coating needs to stay wet. If the ice dries out it will damage the plant and this is when dew point plays an important role. Drier air requires more water to protect plants. Dew point temperatures can be 10°F can lead to more severe freezes. A moderate frost night can have dew points around 20 to 30°F. Strawberry, fern, or citrus nursery growers apply high volumes of water by sprinkler irrigation to protect their plants. At least 0.25 inch/hour or more is required for cold protection. With very low temperatures, low humidity, or high winds, more water must be applied to get adequate protection. Many citrus nurserymen need to apply water at rates of 0.35 inches/hour or higher. Wetting soil prior to a freeze can provide 2 degrees F of protection. The water contains heat that is released, and a wet soil allows heat to be continually drawn from lower depths during the night. Keep plants well-watered.. Container plants are especially vulnerable to the desiccating effects of freezing. Anti-transpirant sprays -- Cloud Cover is one brand -- will provide a couple of degrees of protection if applied at least a few hours before you expect frost. A freeze is more severe than a frost. Tonight temperatures will briefly dip to 32. Frost is more localized and occurs in areas blocked by wind. Temperatures usually go no lower than 29-30 degrees during a frost, and it warms up again the next day. A freeze involves a larger region with significantly lower temperatures and, like we saw in January, freezes may last for several consecutive days.